Bill then became of owner of the track along with Gary Vinge in 1976. Vinge then transferred his part of the ownership to John Ostdiek the next year. Bill also became the promoter of Elko Speedway in 1977, he had the track repaved in the fall of that year increasing speeds dramaticly. Oas also originated a new division to Elko Speedway in 1980. “We needed more participants in the motor pits at that time so, I created the Bombers as a simpler version of the Hobby Stocks of the day,” said Oas. Bill Oas then sold his share of Elko Speedway to John Ostiek in 1981 and resumed his racing career in 1982. Elko raced a Limited Late Model at that time so Oas raced up to six night per week in Wisconsin winning numerous races and setting fast times against some of the toughest competition in the Nation. 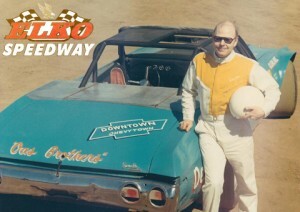 He also raced at Elko Speedway during special events. The final year of racing for Bill was in 1990 when Jim Sauter’s son Jay drove Bill Oas car. Bill has had a very close relationship with Jarry Royle who was his crew chief and head mechanic for many years. Jarry is the father of current Elko Super Late Model racer Adam Royle. Oas admires the driving style displayed by Adam “he is a good shoe,” said Oas. Adam Royle grew up idolizing Oas and said watching Bill race was a great inspiration in his racing career, “he is a great choice for the Hall of Fame,” said Royle.